Responding to a tragic incident with knee-jerk legislation will lead to unintended consequences. Don’t we know this by now, or don’t we care? And at what point do the consequences stop being merely “unintended” and start being “willfully negligent”? “If I’m going to get punched in the stomach, I’m going to take a knife out and get you right back,” said John Lapp of the consulting firm McMahon, Squier, Lapp and Associates. Lapp considers himself one of a new breed of Democratic ad-makers who don’t hesitate to hit hard in the ad war. After all, to be elusive, something must actively elude; I mean, your car keys aren’t eluding you if you’ve just forgotten they’re in your coat pocket. I was looking for an old car radio in the dimly lit basement storage room. Amid the archived esoteric computer peripherals and old gaming systems, I found a stack of magazines. It wasn’t a surprise, really, because I have binders filled with an assortment of old magazines, including: old computer magazines with programs you could type into your Commodore 64 to turn hours of hunting and pecking and troubleshooting typographic errors into minutes of fun with primitive games; decades’ old copies of Writers’ Digest that contain the endless loop of advice that magazine provides; several varieties of home handyman magazines to provide me with fantasy projects that I could handle but wouldn’t want and projects that I would want but couldn’t handle; and myriad single copies of magazines I picked up on newsstands while telling myself that they’re research for my writing career. No, instead of those semi-useful magazines, I found two years’ worth of Spin. Sometime immediately after the turn of the century, I got an unsolicited invitation to subscribe to Spin for two years. As it was, I wasn’t hip to the latest music, and I’d just turned 30. So, with some lottery-ticket hope of recapturing some of my youth, I took the chance and sent the ten bucks, and the magazines started coming. Each issue showed some different group of unwashed kids revolutionizing everything about music. The White Strokes, the Activisions, Dashboard Light, and so on and so on and Scooby Dooby Dooby. Frankly, the magazine didn’t give me the urge to increase my budget for CDs based on the say-so of some music-industry spit-shiners, so I let my subscription lapse. Besides, my music-buying habits in my salad days centered upon buying two dollar cassettes from the racks at Walgreens or Camelot Music and sometimes finding something I really liked, albeit several years and a couple of albums beyond the group’s hits (a-ha and Cutting Crew, for example) and sometimes finding something I played once and then forgot (76% Uncertain et al). So Spin couldn’t help me recapture a youthful musical hipness I never had in the first place. Still, I browsed the magazines and then threw them into a box. Did I intend to keep them in case I needed them for research in the future? Did I keep them in case they became collectibles some decades hence? I’m not even sure I needed that much excuse, as I’m somewhat of an accumulator of things (see also that list of electronic esoterica). However, when I rediscovered this particular stack of magazines, I decided that I would never actually use them for research. They probably wouldn’t be worth anything as a collectible as the next generations, to whom these would be collectibles, won’t actually collect things. And the bands covered within the magazine are probably just flashes in the pan whose names I obviously cannot get correct even now, three years removed from the musical revolution and whatever passes for hits in the iPod world. So I stacked them in a box, but I didn’t throw them into the recycling bin. Perhaps I gave myself a cooling off period to ensure that I did not act rashly in my discarding the valuable-because-I-have-them clutterica. Perhaps my hands were too full (of nothing since I didn’t find the car radio). Whatever the reason, the magazines took up residence in the box on the floor instead of stacked atop binders of more valuable magazines. A couple of days later, I returned to the storage room and found the box of magazines. Now, I could certainly carry the collection to the recycling bin. However, as I looked at the box, I thought perhaps I could list an eBay auction composed of the “collectibles,” but my eBay sense tingled danger, and I knew that I’d only lose my auction fees. Then, I thought about saving them for a yet-unplanned garage sale in the future or using them as a donation to a sale of some sort, but ultimately I’d mark them a dime each and no one would even paw through them. No one pawed through the collection of magazines at our last garage sale earlier this month. So that foolish dream or rationalization too died. Anti-climactically, I carried them out to the recycling. Ultimately, it was that easy; simply lift with the legs and not the back, ascend the stairs, open the door, set down. Once I got the habitual mental hang-ups out of the way, I did it without fanfare. I got rid of something I had no use for but that was only taking up space in our store room. But, contrary to the hopes and dreams of my wife, that doesn’t mark the beginning of a trend in my behavior. These were just Spin magazines, after all, and not a sixth Commodore 64, a box of uncleaned and thoroughly played with G. I. Joes from the middle 1980s, or boxes of comic books that haven’t been out of their plastic bags for fifteen years. Those things have intrinsic and obvious because-I-have-them value. It deals with a recent British widow who decides after her husband’s sudden death to move to a small cottage in the British countryside. She does so and discovers its environs are mostly owned by a land-grabber who has a number of ruffians about. There’s also a faded writer nearby. She moves in, deals a bit with her two children, and then engages a handyman to do a little work on her cottage. That is, in spite of the meaninglessness, the writer character decides to tell the idiot’s tale for us. Marvelous. I’m probably a better person, slightly, for going outside the normal comforts of genre fiction. The book isn’t a bad read, although a trifle slow and slightly alien for a middle-aged American male. 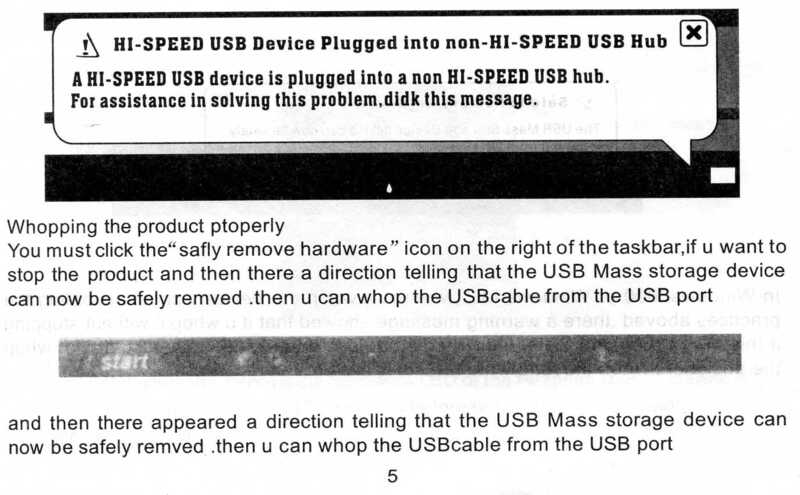 Needless to say, given the quality of the documentation, I do want to whop the product since it doesn’t appear to work. I could have lived my whole life without seeing “u” used as “you” in technical material of any sort and been happy. On the other hand, I was one of the first retailers to have a presence on the Web. I’ve been doing it since 1988 or 1989, and I’ve been reinventing. That’s gotten us a head start. I bought this book on September 29, 2007, and as I suspected, it’s better than the other city-themed picture book I’ve read this year, Detroit. Whereas that book focused on helicopter shots of the buildings in the city, this book covers New York at night. The text is a bit affected with first person sort of you-are-there visitations to New York City in 1983, the photos display a variety of things: people on the job in staged portraiture, buildings, streetscapes, and slice-of-life snapshots. Of course, everyone is wearing that hair that occurred as the 70s transistioned the the 80s, and most of the buildings have bars on the windows before the renaissance of the 1990s, but it’s an interesting artifact and collection of images. With no random quotes, unless you count the introductory essays. I borrowed this book from the Old Trees library’s local history section, a section that I will probably completely consume by the end of 2008. This book covers, as the title might indicate, the Coral Court motel, a motor court built in 1941/1942 that was not only a mainstay on the Route 66 circuit, but also proved instrumental in founding the municipality of Marlborough, a former speed trap town (that has since disbanded its police force and has slid from the St. Louis County consciousness as a result) and provided St. Louisians with something about which it could giggle behind its hands (the fact that each unit had a garage that opened into the bedroom led itself, led itself from the realm of the modern into the realm of the merely seamy once the Interstate built some miles to the north removed the middle class tourist from the client list). This book fits more into the In Retrospect mold, as it provides some text about the original owners, the architecture style, and the evolution of motor courts and motels in America, but mostly relies on quotes from random St. Louisians (and some poetry, heaven forfend) about the motel. Still, the author took a number of photos in the period between the closing of the hotel (1993) and its demolition (1995), and the author gathered some other photo material from people who’d heard about her project. In a couple years, no one will remember the place, since its heydey came in the Greatest Generation years and its ill repute came in the Boomer years, so this book’s novelty will pass but its usefulness as a historical document and collection of photos will live on. Full disclosure: in that same period before the demolition and the raising of the Oak Knoll subdivision where the motel used to stand, I was dating a photographer and got the opportunity to do a little trespassing for photography purposes myself. So I remember the Coral Court from first hand experience, although not from the authentic Coral Court first hand experience. And that first hand knowledge is what makes this book resonate, so as I said, I suspect it will only be a curiosity in a couple years when that resonance is gone for most people. St. Louis County Councilwoman Colleen Wasinger, R-Town and Country, plans to scrutinize next year’s county budget to find ways to save enough money to avoid a tax increase. St. Louis County Executive Charlie Dooley has proposed a county budget of $505.4 million for next year. It includes a property tax increase of 2 cents for each $100 assessed valuation. Dooley estimates that will raise slightly more than $4 million. But Diane Duane, the author of the book I reported on earlier this week, appears in the comments for the post to discuss the book, her library, and writing Star Trek novels. This book, the result of a high school project, came about when Wilda Swift (co-author of Webster Park 1892-1992) started a class to explore local history. Students interviewed a number of residents of the community who could remember life before 1914 and put the book (more of a magazine in a library binding) out. As such, its quality is what you might expect; it looks as though it was typewritten with some photos pasted in. What a high school class could do 30 years ago before desktop publishing became available, then easy. The book doesn’t get into narratives; it just drops little sentence or paragraph excerpts from the interviews organized around topics. So it’s more of a quilt than a cloth. Still, interesting enough to get details and a flavor. Well, I hadn’t been in much mood to read for a number of days, which explains why it’s taken my 10 days to complete another book not written by Tolstoy or Hugo. Instead, to get myself back into the game, I picked up one of the Star Trek novels I bought at some time in the past en masse; the others include the novelizations of the first few movies. Now, I’m not the Star Trek book guy, so this was my first dose of that part of the canon (the Blish short stories based on the series episodes are a different thing entirely; see also Star Trek 5, Star Trek 6, and Star Trek 10 among others). The book was written after the first and second series (I count TAS!) had ended, the first two films were released, and appeared about the same time as the third movie; ergo, it’s historical in its canon. Since it’s a book and has no special effects budget, we get a lot of alien races serving on Federation starships and some descriptions of them. We also get insight into the Romulan way (a sequel to this book, I assume, is called that). But the main thrust of the book is like a television episode with a lot of exposition. The first half of the book details the plot: a Romulan commander, exiled for unpopular views, is set to die in a mission that will foment a Klingon-Federation War. She learns of the existence of a secret Romulan plan to give Romulans the same mentalist abilities that Vulcans have and knows that this will destroy not only the Federation, but the soul of the Romulan empire. She convinces Kirk, on patrol in the Neutral Zone, to act as though she’s taken the Enterprise prisoner so they can go to the research facility and destroy it to save the universe. I don’t want to ruin it for you, but in the last 80 pages, they do. It reads like a filmography and relies on the normal tricks of the showm pseudo deus ex machina and timely reversals, to climax and then a film-friendly denoument. I mean, it’s not a bad book, but it’s not high art; one wonders if the authors of these books write these like movies in hopes of getting the extra dough out of having a movie adapted from it or if that’s just the way they imagine the stories. Or maybe I’m generalizing based on a single data point. I’ll read the rest of what I’ve got and won’t purposefully avoid the series, but jeez, lots of tentacles and an awful lot of characters laughing uproariously at only partially humorous lines don’t compel me to read more right away. Well, it has been a while since I told you about what I’ve bought as far as books go, but that’s because we spent Saturday mornings in the latter part of October looking at sport utility vehicles and minivans because although one can sort of fit a single child seat into the back of a Mitsubishi Eclipse with only slight discomfort for the passenger, two child seats would be impossible. So for a span of a couple of weeks, I bought no books. Fortunately, though, on Sunday, November 4, my mother and I found an estate sale in Lemay. Within a tiny house in one of the older parts of Lemay on a street that ultimately connected to a newer part with larger homes and lawns, some assorted odds and ends remained from a household recently and fairly suddenly emptied. However, in the basement, several boxes of books, mostly paperbacks, lay unpriced. The assortment was rather eclectic; romance novels, 60s detective pulp, philosophy, literature, and some of those paperbacks your grandfather used to keep hidden. My selection includes a couple of Matt Helm novels (I read one earlier this year and watched the Dean Martin movies in the last two years), the first of the Enforcer novels (I read the third earlier this year), a Richard S. Prather Shell Scott novel (I singlehandedly drove blogger Robert Prather from the Web by commenting every time he guest posted on myriad blogs that I loved the Shell Scott novels), and whatnot. You want the full list? Click and look. The stack to the right are some theologically-flavored tomes I bought for my beautiful wife. 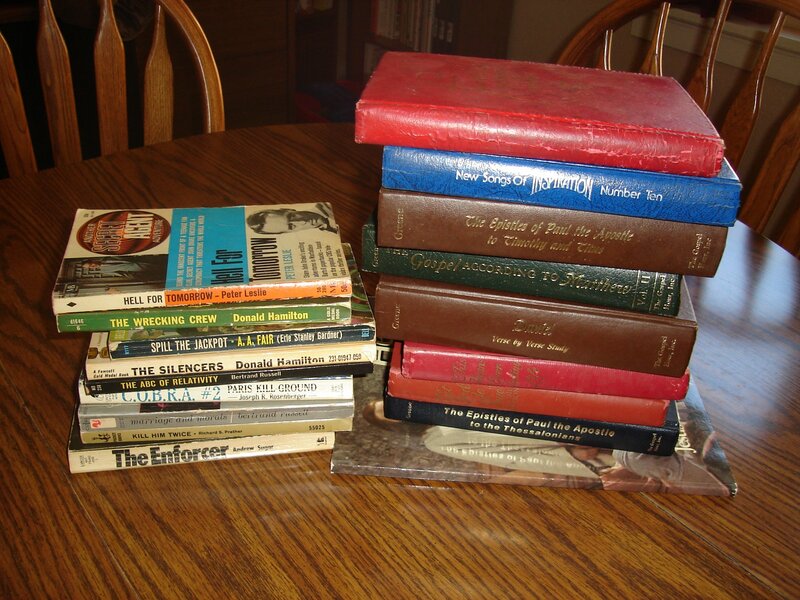 It was only when I got to the counter, manned by the daughter of the fellow who had to take a book everywhere, that I discovered that paperbacks were a dime and hardbacks were a quarter; it’s a good thing I didn’t know earlier, or I’d have had boxes of smoky and musty pulp to show you. Then, last weekend, we actually hit some yard sales in our suburb. Global warming is pushing garage sale season into November; now that we have a full SUV, I am driving it up and down the block to help push garage sales in Missouri into January. I’m not saying that reading Farnham’s Freehold affected my thinking at all, but I did find my basic skills reference works lacking. So I bought, for $25, a seven volume set called The Science Library, a 27 volume set called The Complete Handyman Do-It-Yourself Encyclopedia, and 11 of 12 volumes of the Popular Mechanics Do-It-Yourself Encyclopedia; oddly enough, of the latter, I lack volume 11. My mother has this set, too, and she’s missing volume 11, too. Hmmm. I wonder if that’s where they put all the neat do-it-yourself nuclear things. The fellow also threw in the free sample starter pack of the Easy Home Repair binder series. These were sold by packets you could stick into the binders, kind of like those old boxes of recipe cards. I only got the first set, still in its plastic cellophane, and the binder. That’s okay, though; my mother also owns the complete set of these, and I’ll own them all myself far too soon. 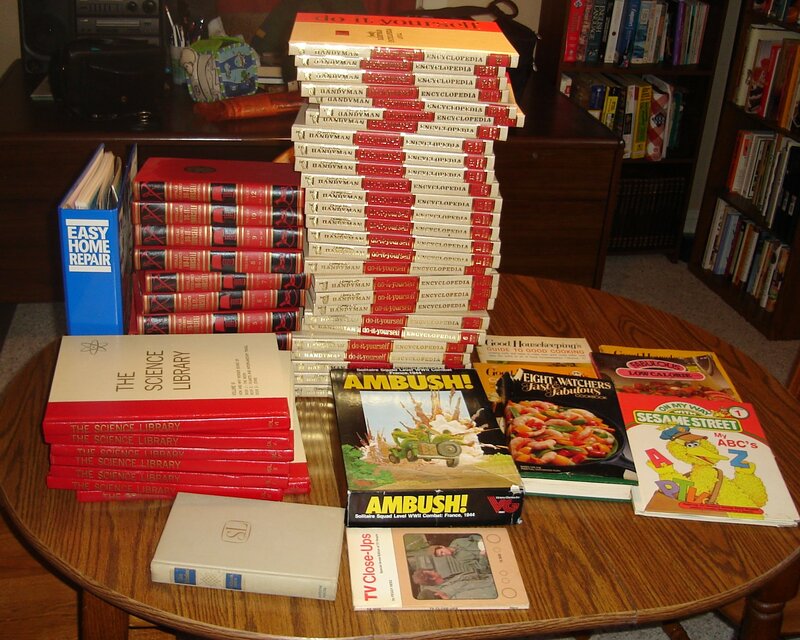 Additionally, I bought a book called TV Closeups, a 1974-1975 book produced by Scholastic or some other children’s book publisher that ties into television and a copy of Sinclair Lewis’s Cass Timberlane. And a copy of the 1984 game Ambush, a solitaire war game. So I’ve added a pile, but not much for my to-read shelf. Regular garage and estate sale stuff has resumed. Thank you, that is all. If you long for a Leave It To Beaver world where life is simple and jobs are secure, watch Nick at Nite and take the civil service exam. Problem: Neighbor downhill from you has a metal roof reflecting its light into your sensitive eyes. Missouri solution: Sue the fellow, the metal roofing company, the neighborhood association, the township, and Hephaestus, probably followed by fines and potential condemnation by the local government. The California solution: Put some glass insect sculptures on the roof to make it pretty colors. Everyone note that the California solution, if applied in Missouri, would meet with the same response; namely, art on your property is cause for lawsuits and legal action. The world’s most powerful airborne laser capable of shooting down a ballistic missile is being re-assembled by Northrop Grumman and the US Missile Defence [sic] Agency (MDA). The laser is being integrated onto MDA’s Airborne Laser (ABL). High-power system testing will follow completion. If you can burn down an incoming missile, you ought to be able to burn down some miscreant 50 miles away too, right? And make a lot of popcorn. 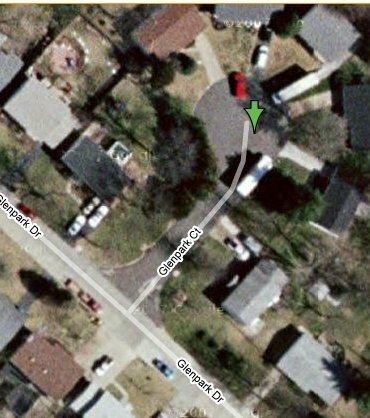 That’s our old house with the moving truck backed into the driveway; the second moving truck sits at the edge of the cul-de-sac, awaiting its turn at carrying away the Noggle library. Heather’s car and my truck are parked out on the main street to make room.